In Genesis 1:9, we read ‘Let the waters under the heavens be gathered together into one place … and God called them seas’. The word ‘waters’ is used in verse 10 [KJV, NIV, NASB], and is an interesting one. Poets sometimes talk about ‘waters’, and indeed the Hebrew poet, David, in the Bible speaks about the ‘still waters’. In English we also use the term ‘waters’ in ordinary speech when we refer to medicinal things such as ‘taking the waters’ or to ‘mineral waters’. The ancient Hebrew writers always wrote ‘water’ as a plural ‘waters’. Their word mayim [waters] just does not occur in the singular. Some linguists call this type of word usage a ‘plural of mass’. In many languages there is a special class of words for liquids, such as water, oil, milk, etc., and these tend to be in plural form. In English we have an example of this in an old plural world ‘molasses’ which refers to a kind of treacle. We just do not talk about ‘molasse’. Because of this ‘mass plural’ the translators of Genesis 1:9,10 have no way of telling from the word mayim alone, whether they should make it singular ‘water’ or plural ‘waters’.1 There is, however, another term used in connection with the ‘waters’ in Genesis I which helps to clear the picture, and that is the word yam [sea]. [Yam is a geographical term for a body of water over a large area, while mayim just refers to the substance.] Now, yam does have a plural, yamin, so we can translate the singular as sea or ocean, and the plural as seas or oceans. We find, interestingly enough, that Genesis 1:10 uses the plural form yamin [… God called them seas] whereas the other examples, all usually translated ‘waters’, are from the mass plural [eg, from 1:6 to 1:10] Armed with this knowledge, we can see whether there is anything significant scientifically about the use of mayim and yam/yamin in Genesis. 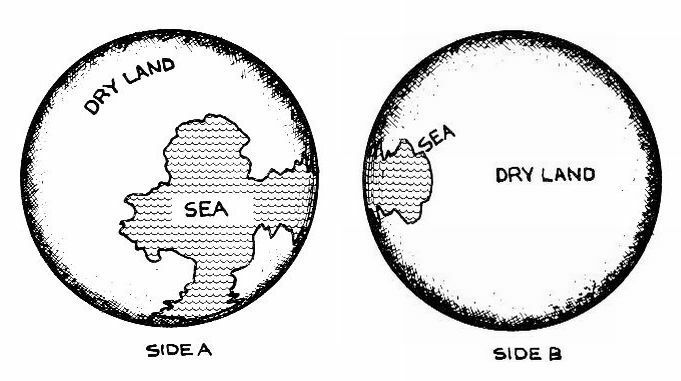 Let us ask the question, Did the early earth have one continuous, vast ocean system joined together as we find it today, or were there a number of separate seas? To answer this question consider one other interesting language clue about the pre-flood world—the expression ‘the waters were gathered together’. This expression is applied to the water which God made into ‘seas’. This really does seem to suggest that all the water was in one area. Notice that it’s the water ‘under the sky’ [v. 9] which is brought together into one place, so that the dry land can emerge. The inference from this word gavah, ‘collect together’, and from the expression magom echad, ‘one place’, is that you wouldn’t expect to find more water than land, and that perhaps the water would be confined to one ‘side’ of the earth’s sphere. We could picture the opposite sides of the earth to look as shown below. As I read the Hebrew of Genesis 1 and 2, I gain the impression from the language that Adam lived in a world in which the continents and the seas were different from what we see today, a world which could not by a slow and steady evolutionary development be transformed from his world to ours, without that divine and catastrophic intervention which we call the flood. In current English we usually say just ‘water’; that is if we’re not concerned whether it is fresh, salt, or mineral waters.